Ruth Campau, Between the Past and the Coming (Eismeer), 2015, acrylic board, acrylic mirror board, radiant acrylic board, wood, 33’ x 28’ x 31”. Ruth Campau’s current exhibition begins and ends with two large-scale installations. In the first room, an array of shiny, sharp, and angular painted acrylic panels litter the floor. Campau has been painting colorful lines across these panels for the past decade, and here they are arranged in a pond of shards called Between the Past and the Coming (Eismeer) (all works cited, 2015), with an elevated gangway that allows you to walk around this geometric fuckfest for a multiplicity of views. The second major piece, Between the Past and the Coming, is very different in appearance. 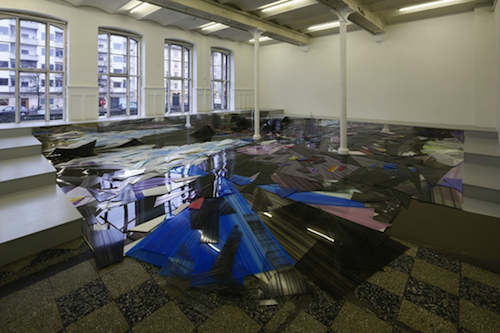 A monochromatic silver series of Mylar sheets installed from the ceiling, it unfurls and unevenly carpets the ground in front of a hanging portion. Its plumbing is also exposed. Wander around back and you’re met with a bright network of narrow, mirrored support columns, some with neon colors applied to their surfaces. In between these two new works are four smaller paintings on a wall, as well as a floor piece. One painting, Closing Down, is made of Mylar with other fabrics drooping down behind a pane of glass. Much abstract painting today is criticized for being merely decorative, but there is too much care taken in the arrangement of the fabrics in Closing Down for the work to have been made by a zombie. In spite of the artificiality of her chosen media—prefabricated and synthetic materials—and their hardness, there is also an underlying delicacy to this painting, owing to the thinness of the material and to her work in general, which doesn’t make us puke from preciousness, but rather it exudes a happily and defiantly plastic air, somehow elevating us.